Blogging has proven to be one of the best methods for engaging customers and prospects and the research shows it. Market Connections’ Federal Media and Marketing Study from 2014 reveals blog readership is up by 12% since 2011. In fact, 40% of government employees turn to blogs to get information. As you plan for 2015, I hope you’ll consider launching a blog or increasing your blog content since it’s a cost-effective way to improve your Search Engine Optimization (SEO) and position you as a thought leader. However, managing a blog is only half of the task. The other half is getting your blog noticed. If a blog is in the 2015 cards for you, Search Engine Journal offers several ideas for marketing a new blog; here are a few of my favorites. 1. Twitter Updates. Twitter is an excellent way to generate buzz in your community. Use keywords in your tweets that best describe your blog. Make sure to engage readers further by re-tweeting and commenting on others’ tweets. 2. Twitter Feed. If your blog is powered by WordPress, install the “Twitter Feed” plug-in on your account. It enables you to include your Twitter timeline into your WordPress site. 3. LinkedIn. First, build your LinkedIn network to expand your reach and connect to a large network of people. Make sure you post a status update on LinkedIn once or twice daily to engage your connections. Once they get used to seeing your posts, promote your blog in your updates. 4. Cliffhangers. 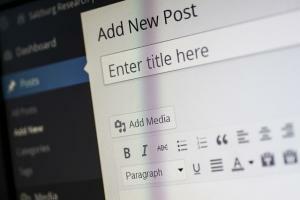 Use enticing descriptions in your social media updates to get people to click through to your blog. Use phrases such as “read more about” or “click here.” These cliffhangers will drive people to your blog to read the full story. These are just a few of the many ways to promote a blog. By implementing these simple yet effective tips, you can help your blog become a key part of your marketing and business development. If you are currently looking at 2015 planning and adding a blog is part of your thought leadership program, please let me know. I’ll be glad to talk with you about not only creating and managing a blog, but how to promote the blog in order to increase your brand awareness.